Fluorescence Lifetime Imaging (FLIM) produces an image based on the differences in the excited state decay rate from a fluorescent sample. Thus, FLIM is a fluorescence imaging technique where the contrast is based on the lifetime of individual fluorophores rather than their emission spectra. The fluorescence lifetime is defined as the average time that a molecule remains in an excited state prior to returning to the ground state by emitting a photon. As the fluorescence lifetime does not depend on concentration, absorption by the sample, sample thickness, photo-bleaching and/or excitation intensity it is more robust than intensity based methods. 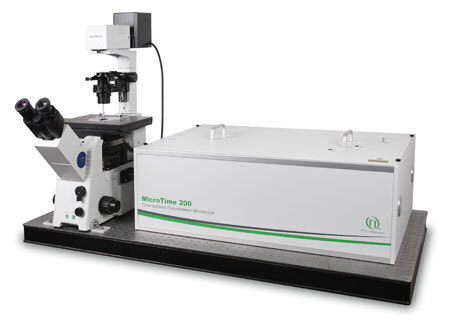 At the same time, the fluorescence lifetime depends on a wealth of environmental parameters such as pH, ion or oxygen concentration, molecular binding or the proximity of energy acceptors making it the technique of choice for functional imaging of many kinds. Time-Correlated Single Photon Counting (TCSPC) is used to determine the fluorescence lifetime. 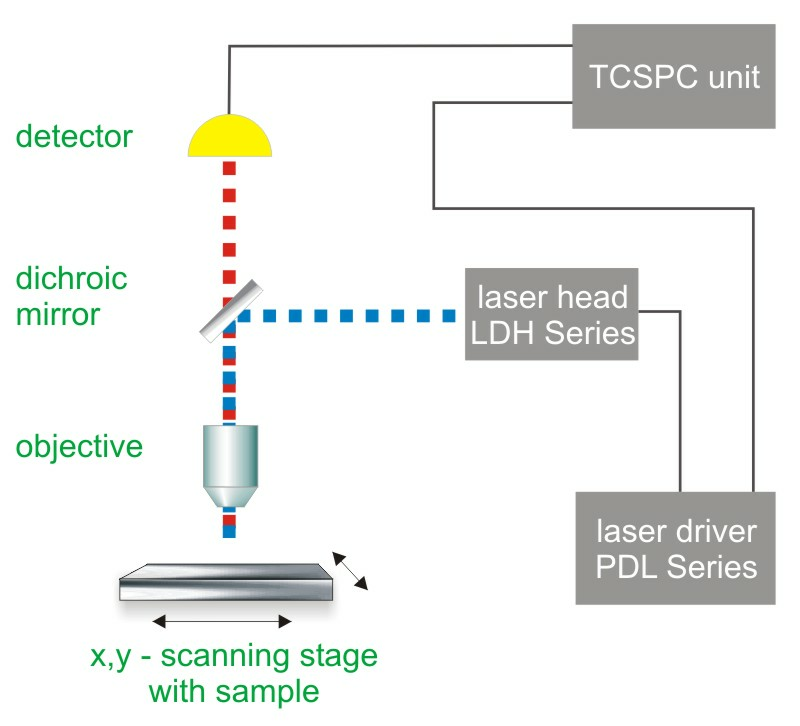 In TCSPC, one measures the time between sample excitation by a pulsed laser and the arrival of the emitted photon at the detector. TCSPC requires a defined “start”, provided by the electronics steering the laser pulse or a photodiode, and a defined “stop” signal, realized by detection with single-photon sensitive detectors (e.g. Single Photon Avalanche Diodes, SPADs). The measurement of this time delay is repeated many times to account for the statistical nature of the fluorophores emission. The delay times are sorted into a histogram that plots the occurrence of emission over time after the excitation pulse. 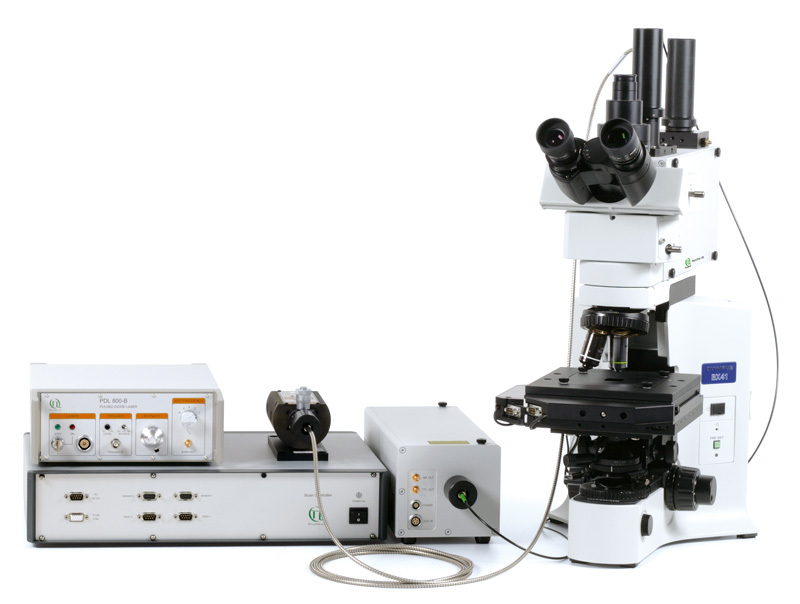 Confocal Laser Scanning Microscopes (LSMs) are widely used tools in cell and molecular biology, biochemistry and other related sciences. 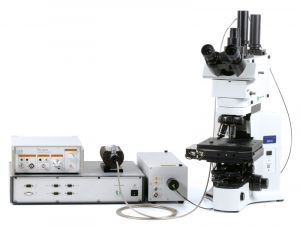 PicoQuant's LSM Upgrade Kits greatly enhance the capabilities of these microscopes by extension to time-resolved techniques, and thereby providing not only Fluorescence Lifetime Imaging (FLIM) but also Fluorescence Correlation Spectroscopy (FCS) and a wealth of other time resolved techniques. The LSM Upgrade Kit combines PicoQuant products to a ready-to-use kit that fits your specific application on a state of the art Laser Scanning Microscope of your choice from Leica, Nikon, Olympus or Zeiss. The fluorescence lifetime can change depending on the fluorophore environment (which means polarity, pH, temperature, ion concentration etc.) and is therefore used as a parameter for biological sensors. Specifically, fluorophores return to the ground state through radiative and non-radiative processes. Quenching of the excited state by external factors decreases the fluorescence lifetime. The resulting lifetime shortening provides information about the molecular environment of the fluorophore and even allows for quantitative distinction between subpopulations of quenched and unquenched fluorophores. A special case for the influence of the local environment on fluorescence lifetime is fluorescence resonance energy transfer (FRET), where the donor dye is quenched by the presence of an acceptor dye. Thus, a decrease of the fluorescence lifetime is indicative for FRET. In this way, the fluorescence lifetime serves as a sensor parameter for intra- and intermolecular interactions allowing for distance measurements in the nanometer range. Applying an intramolecular labelling approach, the distance between the dye and the quencher or FRET acceptor can also vary along with different conformations of the labeled biomolecule. In this way, intramolecular changes e.g. due to folding or action of molecular motors are detectable. With the advancement of fluorophores and microscopy, researchers now are able to use several fluorescent markers in parallel to assess different processes simultaneously. One challenge is that the employed fluorophores need to be distinguishable and have commonly used spectral characteristics. This limits the number of useful fluorescent markers. The analysis of the fluorescence lifetime can help to overcome these limitations. Additionally, the fluorescence lifetime enables to discriminate label fluorescence from the fluorescence background of the sample (e.g. cell or tissue) and thereby allows a higher detection efficiency and more accurate marker localization. The autofluorescence can be characteristic for a certain tissue and therefore be used e.g. for tumor detection. Typically, Two-Photon Excitation (TPE) is combined with Non-Descanned Detection (NDD) for deep tissue imaging, as these applications are generally more prevalent in tissues or organisms. Calcium ions (Ca2+) are an important messenger in brain signalling. In situ Monitoring of the resting concentration and rapidly changing concentrations of Ca2+ is important for understanding neural communication. 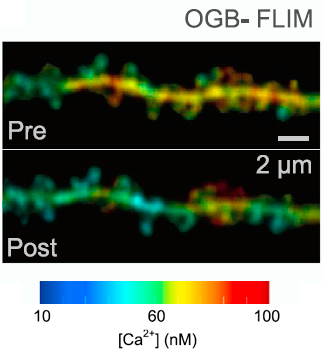 The fluorescence lifetime of the dye Oregon Green BAPTA-1 (OGB-1) is highly sensitive to nanomolar [Ca2+], which makes it a great tool for mapping resting [Ca2+] in neurons and astroglia. Zheng et al. Published an improved technique that allows directly correlating the measured fluorescence lifetime to [Ca2+] values using a calibration. FLIM provides several advantages over intensity-based measurements using ratiometric Ca2+ indicators: It is insensitive to emission intensity, fluctuations in dye concentration, focus drift, imaging depth, light scattering and photobleaching. Moreover, Zheng et al. showed that the fluorescence lifetime of OGB-1 does not depend on micro-viscosity, temperature, physiological changes in pH, as well as Mg2+ and Zn2+ concentrations. Thus, OGB-1 is an excellent lifetime-based sensor for monitoring resting [Ca2+] in brain slices and in vivo. 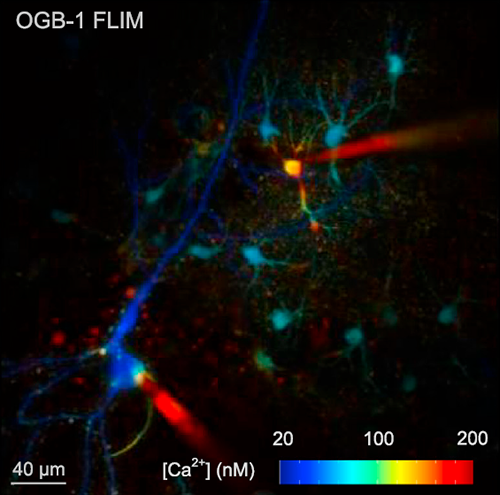 In the first figure, a FLIM image of whole-cell OGB-1-loaded CA1 pyramidal cells and astroglia is shown. One can see that the CA1 pyramidal cell (dark blue) has a lower [Ca2+] than the astroglia (light blue). The two red shapes are pipette tips. The second figure shows a spiny dendritic fragment of a CA1 pyramidal cell, in resting condition and about 5 min after a short burst of back-propagating action potentials. The FLIM reveals that the signalling activity led to a reduction of [Ca2+]. Invisible ink is a common security technology and authentication feature used for example in banknotes or passports. FLIM measurements can make invisible ink visible, due to the fluorescence lifetime of the used dye mixture. Therefore, it would be possible to identify the ink mixture and attribute it to the company producing that ink type. In this example, FLIM images of a paper showing a guilloché pattern written in invisible ink were acquired. The ink mixture consists in this case of two different dyes. To separate them, the FLIM data were fitted using a 3-exponential model. In the lifetime histogram, the shortest component of the fit corresponds to the paper auto fluorescence (0.5 ns), while the two longer lifetimes (3.6 ns and 6.6 ns) can be attributed to the two dyes forming the ink mixture. The lifetime distribution can be visualized by performing a pixel-by-pixel fit and plotting the results as a Red/Green/Blue (RGB) color code. The shortest lifetime component (0.5 ns), corresponding to the paper auto fluorescence, is displayed in red. The lifetimes of the two dyes are shown in green (3.6 ns) and blue (6.6 ns). As can be seen from the lifetime histogram, the concentration of the dye with the longest lifetime was very low. Contributions from paper auto fluorescence can still be detected in the green and blue coded images. However, the paper contributions can be clearly distinguished from the ink dyes by applying a pattern matching analysis. Furthermore, FLIM can be used to evaluate paper and printing quality and validate whether all components were added to the ink mixture. Sharp edges and homogenous ink adsorption are an indication of high paper quality. Not all dots showed a uniform ink distribution and well-defined shape, as can be seen from the FLIM image, where the average lifetime is color coded. The lifetime histogram shows that the same three components as described above are present, but in a different ratio. In this case, the ink contained an equal amount of both dyes. Samples courtesy of U-NICA Group, Switzerland. Control of humidity in wood is an important aspect for woodworking. The humidity of wood needs to be assessed and equilibrated before using it in further processing steps. For this purpose, FLIM measurements are a useful tool, as it can help to determine the humidity by monitoring the auto fluorescence of the wood. In the FastFLIM image below, the auto fluorescence lifetime clearly changes depending on the humidity. Dry wood has a longer lifetime (center) whereas moist wood has a shorter lifetime (right). 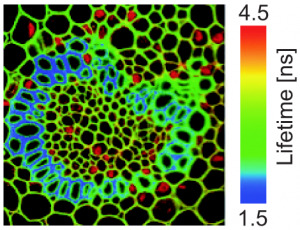 The auto fluorescence lifetime of wood at room humidity lies in between these two states (left). Beside assessing the humidity of wood, FLIM provides a detailed insight into the structure of sliced wood pieces. 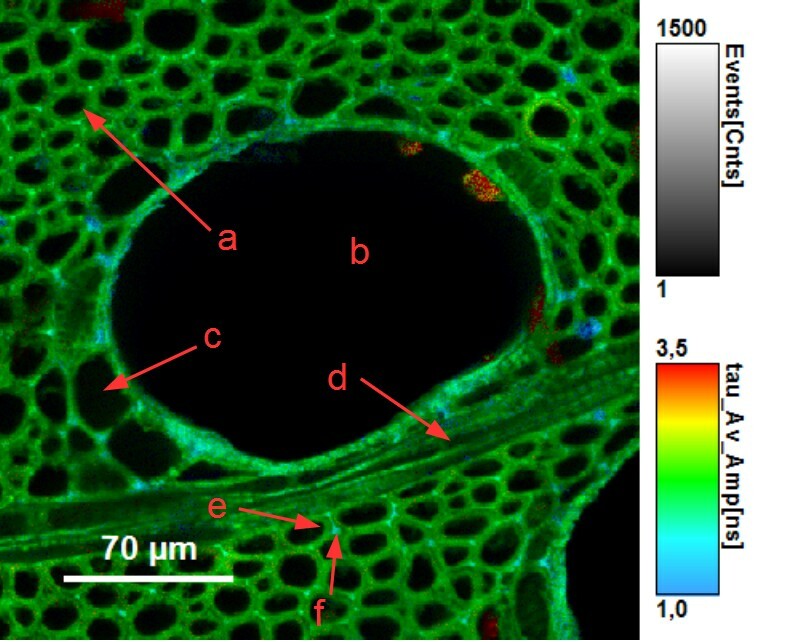 The picture below contains a horizontal cross section of ash wood (fraxinus excelsior) showing the different wood tissues: fiber cells (a), vessel cells (b), parenchym cell (c), wood ray (d). Fluorescence lifetime allows to distinguish between cell wall (e) and middle lamella (f). Samples courtesy of Henry Bartsch, IHD Dresden, Germany. Nanodiamonds (ND) featuring fluorescent nitrogen vacancy (NV) centers have increasingly received attention as labels, as they are exceptionally photostable and do not blink. Since their fluorescence lifetime of approximately 17 ns is significantly longer than that of commonly used organic fluorophores, they provide great FLIM contrast. Furthermore, NDs are non-toxic and can thus be used for in vivo bioimaging studies. The charge and emission properties of the NVs depends on the particles surface chemistry. In the negatively charged state (NV-), the emission occurs at 575 nm, while in the neutral state (NV0) light is emitted at 637 nm. Thus, the ND emission spectrum can report on changes to surface charge due to noncovalent binding events. In this example, NDs were incubated first with water and then with the linear, positively charged polymer poly (diallyldimethylammonium chloride), which adsorbed to the ND surface. The NV0/NV- ratio was monitored via fluorescence intensity in two spectral detection channels. In order to suppress background noise, only pixels containing fluorescence with a lifetime longer than 13 ns were used for analysis. The observed change in NV0/NV- ratio indicates a change of ND surface charge after addition of the polymer. Luminescent single-nanometer-sized diamond-like carbon particles have received considerable attention in biophysics, material science, nano-medicine, and photonics. Partly this is related to their extraordinary material properties, such as chemical inertness, biocompatibility, and hardness, and also partly due to their exceptional photostability. All of these applications desire the availability of sub-10 nm particles that show bright and stable photoluminescence. The fluorescence lifetime image of NV centers in nanodiamonds shows lifetimes with a mean value of around 17 ns, only slightly longer than the bulk value of the defects. In order to gain a statistically significant insight into the distribution of fluorescence lifetimes, a FLIM image of several nano crystals on a glass surface was recorded (Fig. a). The suggested reason for the fluorescence lifetime distribution (Fig. b) is the dipole orientation of the NV centers with respect to the glass coverslip they are deposited on. Typical fluorescence lifetime decay curves of two different nanodiamonds are shown in Fig.c. Due to the increasing number of fluorescent proteins and specific labeling techniques, it has become possible to stain multiple target molecules in parallel and observe their interactions as well as their multiple localizations within the sample. This raises the question about how to discriminate between the various labels. In the classical way using a spectral approach, the multiple components in such a system are stained each with spectrally different fluorophores allowing for multicolor imaging. Spectral unmixing helps to raise the number of distinguishable labels. This number is even increased by including the fluorescence lifetime as an additional parameter. Consequently, more fluorophores can be monitored and separated simultaneously within a sample, and the specific labels can be efficiently separated from inherent autofluorescence. This example from plant biology shows Arabidopsis root cells transformed with a GFP-tagged PIN2 variant. The PIN-protein group is involved in root graviotology. 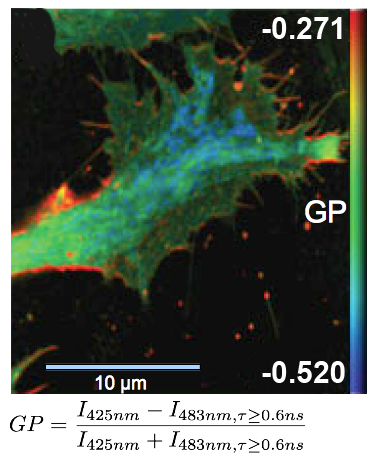 Pin2-GFP excited with a pulsed 470 nm laser has a significant longer lifetime than the autofluorescence of the Arabidopsis root cells (middle panel “average Lifetime”). A three-component lifetime fit was applied and the 2.5 ns component was specific for GFP fluorescence (upper image in “Lifetime components”), whereas the shorter lifetime species belonged to background fluorescence (lower image in “Lifetime components”).